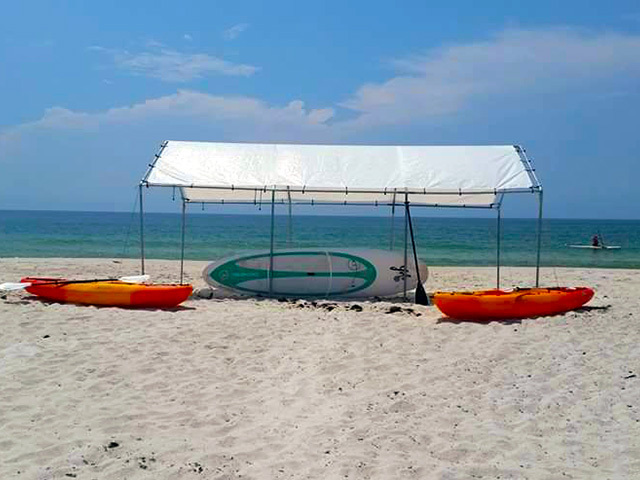 Our 10′ x 20′ Beach Canopy is great on those hot days when you need to get out of the sun…but, still enjoy the beach. This canopy has full UV protection and provides a large shade area. We book this canopy in one week intervals. So pick the start date you would like us to set up the canopy and we will have it ready for you that morning. We set up and take down each day as per Beach Ordinances. And, remember to let us know what address you want us to set up the canopy at. *NOTE: Beach Canopy’s are NOT allowed in Gulf Shores per City Regulations.